If you ever needed to sync and share files across all your computers and devices, then SugarSync is a perfect service for you! Even though it is completely free, it still comes with the full support to some of the most sought features in the market – easy uploading, automatic version detecting, online backup, mobile apps, great security, file sharing, and remote accessing. With such comprehensive attention to details and powerful features, SugarSync will without a doubt make your life easier and your work more productive. Upload your files on the Internet and download them anywhere! Keeping your files in perfect synchronization among several computers has become a holy grail of online backup services, who promote their various ways of protecting your security, file integrity and all the possible ways of making your life easier and work more productive. One of the services that has managed to distinguish itself by offering powerful and uncompromising features for really affordable price is SugarSync, cloud service established in 2009 with a goal to to bring everyone active synchronization between not only PCs running Windows and Mac, but also devices that are powered by Android, Windows Mobile, BlackBerry OS, Samsung SmartTV and even Symbian. SugarSync is regarded today as one of the most feature-full, reliable and easy to use file backup and synchronization software, often managing to beat all competition in the reviews from famous review sites. It managed to attract professional and seasoned userbase by offering instant syncing, fully encrypted storage, integrated webapp editors for easy on-the-fly management of several types of documents, media transcoding support that enables you to directly enjoy media of many types on all devices and OS’s that support SugarSync, and powerful API kit for building connections to 3rd party applications who can create, read and modify files on SugarSync. This API support has enabled internet community to expand capabilities of SugarSync in several ways, most notably creating a brand new desktop client for Linux, and OS that is not natively supported by SugarSync developers. The best way to describe user interface of SugarSync would be to say that it is beautiful, functional, fast, and very modern. This design remains consistent and easily-useable no matter how you access SugarSync’s service – from their website, standalone PC client app, tablet or smartphone apps. All that you need to do to share files between PCs is to log in into webapp, client or portable app, select what directories you want to share, and all the rest is automated. Every smallest change in those files and directories will be instantly synced, and you can track those changes by accessing “Activity” feature that logs every action SugarSync makes. 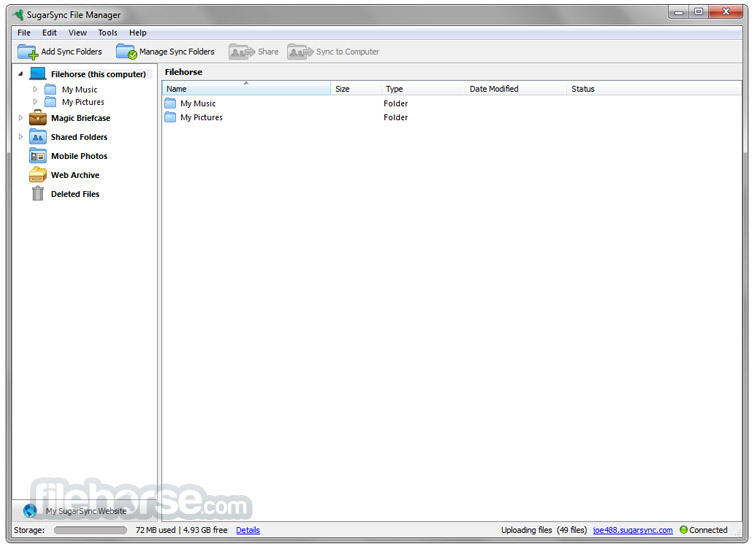 Sharing your files and directories to friends is also very much present. Upload your files on the Internet and download them anywhere! Registration of a new account on SugarSync is free, but it is sadly time limited. 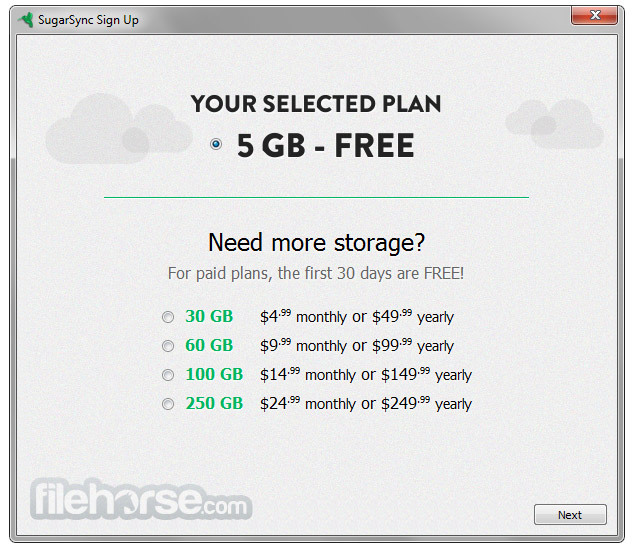 You will get only 30 day trial in which you can choose the size of your online storage – from 60 to 500 GB. After that short period, you need to start paying subscription or stop using it. For individual user, prices for storage range from $$7.49 per month for 60 GB of storage ($74.99 per year) to $24.99 per month for 250 GB of storage ($249.99 per year). There are also two advanced tiers. Tier with 1000GB enables access to 1-3 users, advanced admin control and few other customer support features for $55 per month ($550 per year) and unlimited storage for more than 3 users can be purchased for a price that is tailored to your specific needs. Without any shadow of a doubt, SugarSync has managed to successfully prove that it offers features and pricing that rivals anything that can be found today in the space of online backup and syncing. Dropbox, Google Drive and SkyDrive offer similar usability and some of its features, but where SugarSync clearly wins is in its wide reach and pricing plans that are very generous. With the SugarSync Mobile App, you have access to all of your data, right from your smartphone or tablet. SugarSync provides data security you can count on. It uses best industry practices to ensure that your data is safe and secure. Your files are transferred securely using TLS (Transport Layer Security). Upload your files on the Internet and download them anywhere! 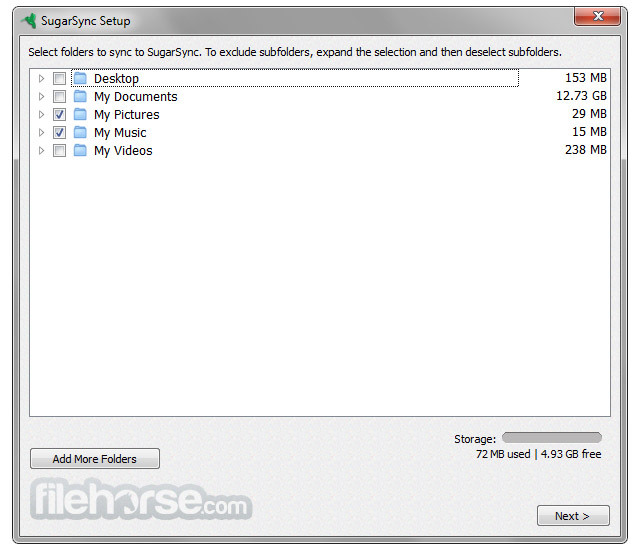 SugarSync is the perfect solution for backing up all your music, photos, and video. Cloud storage for your music and photo collection means it's securely backed up and accessible anytime, from any computer or device. Get remote access to your files, photos, and media from anywhere. 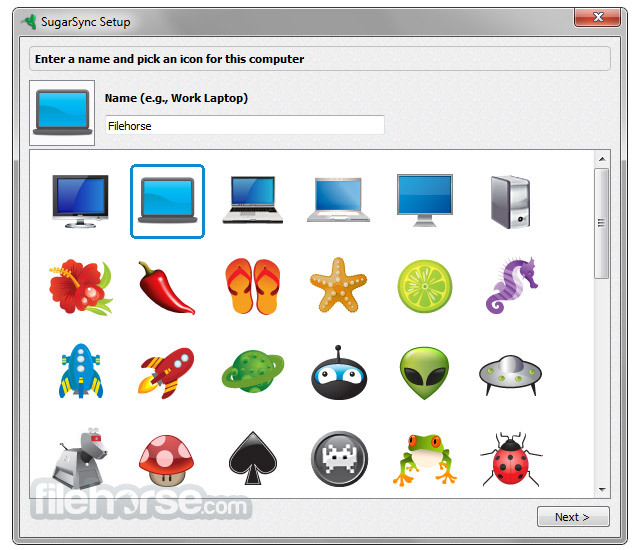 Just log in to the SugarSync website from any computer to access your important folders and files. With SugarSync's mobile app on your device, you can view, share, and access your data on the go. SugarSync provides data security you can count on. SugarSync makes sharing a breeze. Whether you are sharing one file, or an entire folder with hundreds of files, a few clicks is all it takes.